DipABRSM qualified. Taught in London since 2002, and in Devon since moving here in 2015. I have been teaching for 16 years and teach anyone who has an interest in learning, from absolute beginners up to Grade 8 standard. 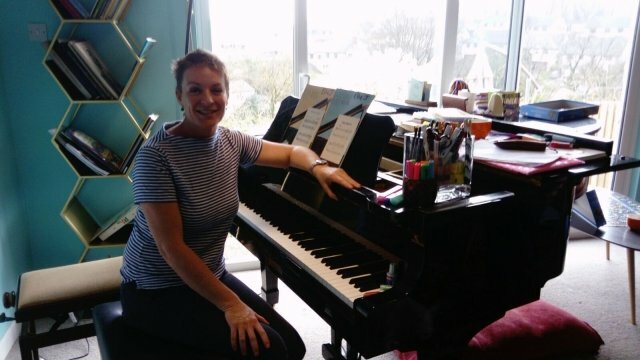 There is no upper age limit to learning and enjoying the piano - I have taught many happy piano students in their 70s! I was Suzuki method trained and use aspects of this in my teaching, and though I am freer with use of repertoire, the important aspects of ear training and consistent practice are always present. For those who desire, I use the ABRSM exam board and teach all grades in performance, as well as grades 1 to 5 in Music Theory (very useful to those who are studying Music GSCE or applying for a music scholarship). I spent 8 years working as an accompanist for a school in South London (St. James the Great RC Primary School - Thornton Heath) where I also took Recorder Club. Music is a science and an art; a skill that is a pleasure to have (and hear!) at any age and at any level. Playing piano promotes hand/eye co-ordination and improves concentration. Learning to play the piano takes perseverance, patience, discipline and commitment - and yes, it's all worth it! I believe in a friendly and patient approach to lessons, which are one-to-one. Everyone is unique and thus will progress in different ways and at different rates. My philosophy is to create and environment of encouragement and positivity. EleanorFrom Stephen (5/5): Very friendly, very relaxed. As a beginner and not a kid by a very long way I was a little worried how it would go. Ellie was great, very professional and answered all of my questions, even the stupid ones.